A few week ago, before I stitched together my Zipper Rippled Jacket, I acquired a new sewing machine! Though my old machine worked and did well on sweater knits with a walking foot, there was no way it was ever going to sew through the thickness that is the rippled jacket fabric, never mind that leather trim! My old machine was a basic mechanical and needed coaxing to stitch through anything heavier than two layers of double jacquard sweater knit. My new machine is a basic mechanical and makes every seam seem fun and easy so far, even when topstitching that jacket or sewing through leather! I purchased a new walking foot for the new machine, because once you've used one, it's hard to imagine living without. 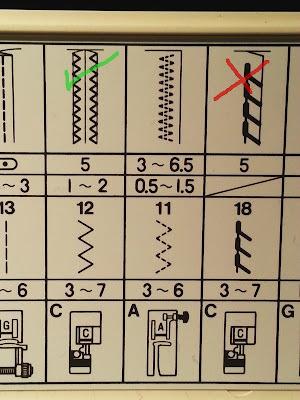 The new sewing machine came with several presser feet, however, including an overedge foot (a/k/a overcast foot). Now I don't really need an overedge foot; I have a serger. But since I now have an overedge foot, I thought I'd give it a spin. This is my overedge foot, Janome foot C.
Step 1. Attach the overedge foot. Please follow the instructions in your manual for your machine. I'm working with a Janome foot C. This is a snap on foot and, there was no need to detach the foot holder. Step 2. Place right edge of fabric against guide, slightly beyond the needle. You can see the guide in the most clearly in the photo above. It's the black flange on the right. The guide on your machine may be slightly different. With needle still up, lower presser foot. Step 3. Set your machine for overcast or overedge stitching. If your machine is computerized with automatic settings, perhaps a couple taps on your touchscreen is all that's needed. Your machine, however, may need further adjustment, as mine did. This is where you must be sure the stitch width is set correctly. My manual recommends a 5 mm width. You can check your width by turning the handwheel slowly toward you and making sure the side to side action of the needle clears the bar(s) on the presser foot which hold the fabric down. (The bars, seen in the top photo, are parallel to the side edges of the presser foot.) 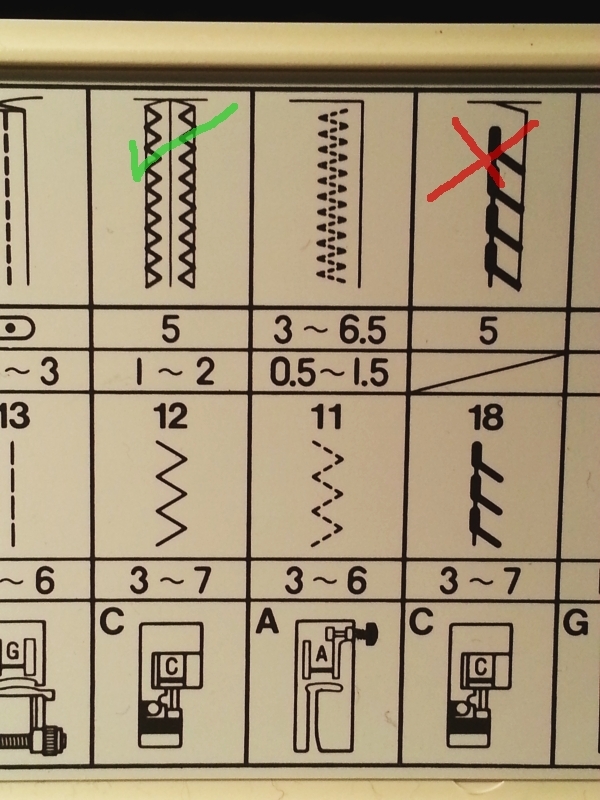 The stitch length recommended in my manual was 1 - 2 mm. I used was 1.5 mm. You may also need to adjust your thread tension. I found that the zigzag overedge stitch worked better on the sweater knit than hockey stick. Step 4. Stitch while gently guiding your fabric against the guide. 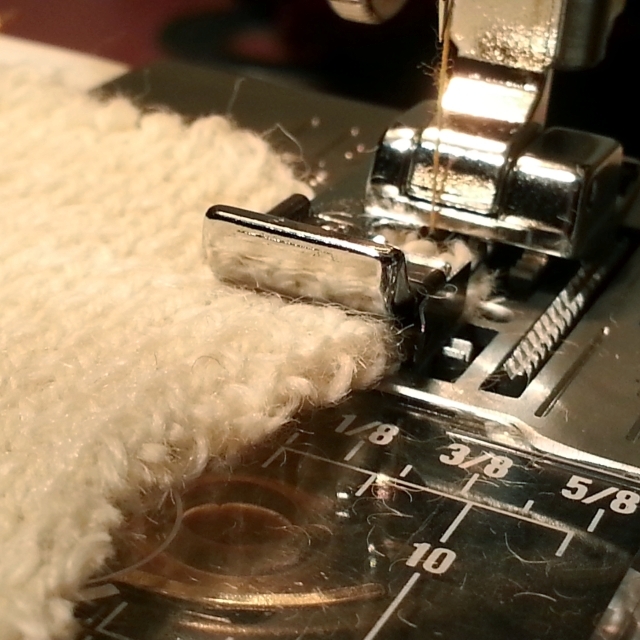 There is no differential feed (like on a serger) and no upper feed dogs (as with a walking foot) when working with an overedge foot on a sewing machine. Smooth and steady work best. Step 5. Change to your walking foot or zigzag foot and sew your seam. Once the edges are finished, you can put right sides together and stitch the seam. I used a wobble (narrow zigzag) stitch with the width at 0.75 mm and length at 3.0 mm. It's not as neat as a serged edge, but it will keep the edges from raveling or fraying. 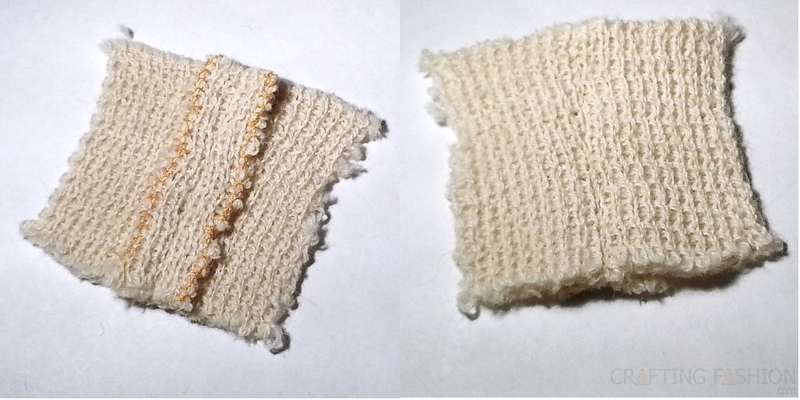 The cleaner you cut your edges and steadier your speed, the neater your overedge stitching will appear. Always practice on cutaways first to get all settings correct. Overcasting all edges right after cutting stabilizes the edges nicely, but you'll still need to use appropriate stabilization at the shoulders (and perhaps other places) in your garment. 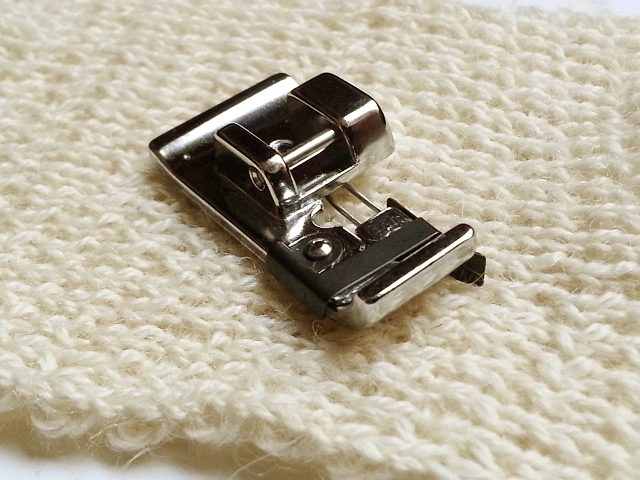 There exists a foot called a side cutter, which trims the edge and does overedge stitching, imitating a serger. I don't personally know anyone who has used one, but I watched this video on YouTube, where the demonstrator uses a side cutter foot on thin cotton woven fabric. I have the feeling it wouldn't work with a sweater knit. Do you have experience with an overedge foot or a side cutter? Any tips? Please share.